Everyone who watched the Breaking Bad finale offered an opinion on the show in some form. And a lot of the debate swirled around where to place Walter White’s hellish odyssey in the pantheon of great television. 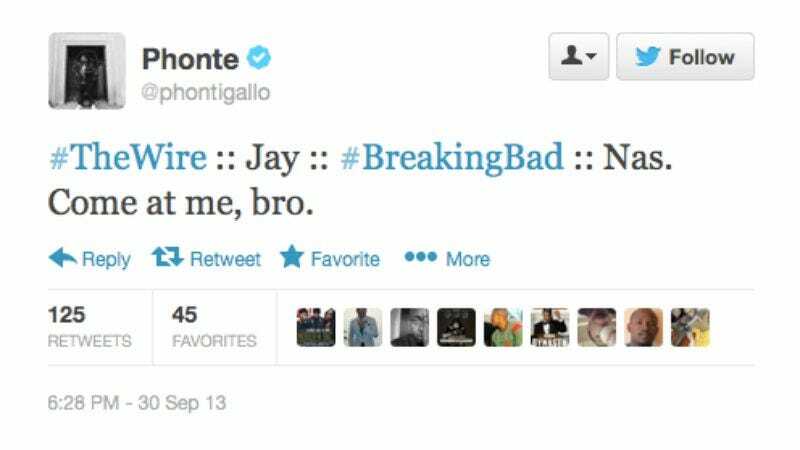 But rapper Phonte, of Little Brother and The Foreign Exchange, took that game to the extreme, tweeting an extended analogy comparing major rappers to television shows based on career trajectory. He starts by outlining The Wire, Breaking Bad, and The Sopranos as Jay Z, Nas, and Rakim respectively, and then riffs on 14 other rapper/television show parallels with frightening accuracy. His assessments of Lupe Fiasco as The Newsroom and Snoop Dogg as Law & Order are incredibly on point, and though Kanye would quibble with being compared to a show that isn’t the unanimous GOAT like Lost, the shoe fits. (His self-assessment as Arrested Development has just the right twinge of humor to forgive the bump in prestige.) Phonte has clearly watched a lot of television—though might we suggest Six Feet Under, Deadwood, or The X-Files next?—and most of his comparisons make an astounding amount of sense (nobody like Biggie should suffer a comparison to How To Make It In America). And now we wait for a poster company to create a cleverly designed mock-up for college freshman to slap on dorm room walls.